personality ▹ appears chic/cold 'taciturn', but is a warmhearted person. difficulty expressing his true feelings. perfectionist. blunt by nature. habits ▹ include biting lips, putting finger up to lip, scrunching his nose, grabby hands, covers his face when he's embarrassed, occasional excessive blinking. "First off, Kai loses things all the time. I think he loses at least one thing a day. Whenever he gets in the car, he asks, 'Where's my cell? Did you see my wallet?' He asks things like this everyday. He loses things all the time." "I am a blunt person by nature. Might it be during shows or during fansigns, I don’t really do fanservice. The fans ask me if I’m in a bad mood but in reality, I’m a really warmhearted person. I want to do fanservice… so I’m putting in a lot of effort." 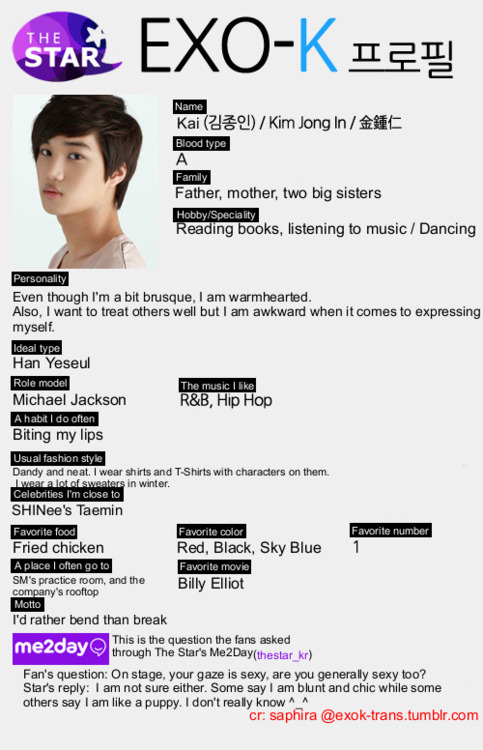 "I am the only EXO-K member to have a bronzed skin color. Also… my lips are thick and I have double eyelids. Haha." "I am not the kind to be really concerned by the age." "I rather bend than break."